Image Size: 19-3/4" x 14-3/4"
Bill had some fun with the title of this image, a pun on "court" and "yard." 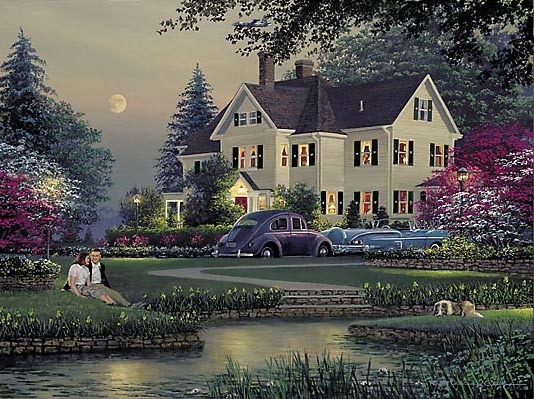 The soft spring evening naturally inclines the young couple's thoughts to love, but look at one of the second story windows--you'll find someone keeping a sharp eye on the proceedings? Phillips fills the scene with many nostalgic touches, including the Volkswagen Beetle and 1958 Chevrolet Impala convertible parked in the driveway. We think you'll agree that Courtyard is attractively priced, and its slightly smaller size makes it perfect for display just about anywhere.